Lol! way to go bat family!. He does care about them but this is just... سونا ;). Wallpaper and background images in the Young Justice club tagged: young justice nightwing robin batgirl batman bat family. jk jk. But just once. ONCE. I would like to see Bats hug each one of them! that's batman for you. like aww come on batman they're still family give 'em a hug or something. ^ Yeah. After all, Batman is kinda their father. Also the kids need parenting love! i have a feeling if they made season 3....and brought in red hood like they most definitely would......nightwing would hug him like no bodies business. "ok goldenboy, you can get off me now. get. off!" "NO! this is brotherhood crushing your internal organs!" ......any1 else see that happening? with an audience? ...anyone? 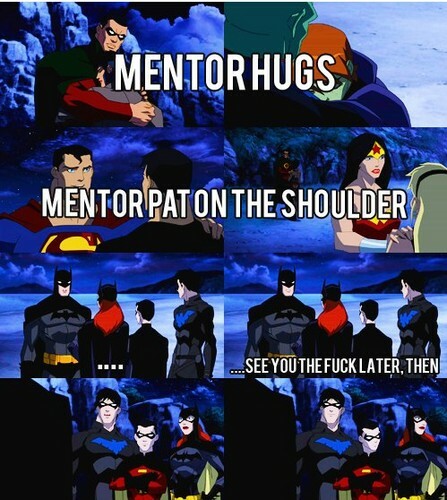 Bat men begets hugs !